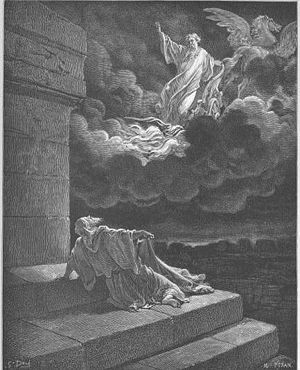 Elisha sees Elijah ascending to heaven. According to the Bible, Elisha was a powerful prophet in the Kingdom of Israel during the mid-late ninth century B.C.E.. Known as the successor of Elijah the Tishbite, Elisha was an absolute opponent of Baal worship and one of the mightiest miracle workers in the Bible. He distinguished himself as a model disciple to his master Elijah. Then after inheriting the mantle of leadership, Elisha did even greater works than his master, healing the sick, raising the dead, parting the waters of the Jordan, and striking an entire army with blindness. Elisha was also a major political actor. He consorted with kings and was instrumental in the defeat of armies and the lifting of sieges. His agents assassinated three kings, and he instituted a violent purge of the descendants of Israel's King Ahab. After the ascension of Elisha's candidate, Jehu, to the throne of Israel, Baal worship was strongly repressed for a time. On his deathbed, Elisha continued to prophesy, and at least one miracle was reported in association with his remains. While critical scholarship considers much of the Elisha story to be legendary, rabbinical tradition holds him to be a great mystic and one of the originators of the Kabbala, or Jewish mystical tradition. Elisha's ministry took place against the background of troubled times for the prophets of Yahweh, for they faced persecution under the influence of Jezebel, wife of King Ahab of Israel. 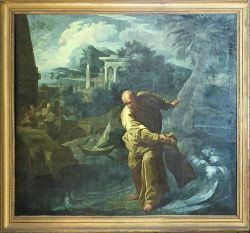 The prophet Elijah was Jezebel's chief antagonist in this struggle and had been forced by Jezebel into exile in the south after instigating the slaughter of 450 prophets of Baal at Mount Carmel. Go to the Desert of Damascus. When you get there, anoint Hazael king over Aram (Syria). Also, anoint Jehu son of Nimshi king over Israel, and anoint Elisha son of Shaphat from Abel Meholah to succeed you as prophet. Jehu will put to death any who escape the sword of Hazael, and Elisha will put to death any who escape the sword of Jehu (1 Kings 19:15-17). As it turned out, Elijah himself completed only the commissioning of Elisha, leaving the other tasks to Elisha. On his way from Sinai to Damascus, Elijah found Elisha plowing a field with his oxen. Elisha responded immediately to Elijah's call, pausing long enough only to kiss his parents goodbye and slaughter his oxen. For the next seven or eight years, Elisha apparently became Elijah's close attendant. The Bible is silent concerning Elisha's activities during this period, however. By the time Elisha emerged in his own right, King Ahab had won two important military victories against Israel's enemy, Ben-Hadad of Syria, with God's support. However, Ahab also ran afoul of Elijah over the matter of Naboth's vineyard. Ahab repented to God before Elijah, and God grated him a reprieve. However, when Ahab joined forces with King Jehoshaphat of Judah and marched once more against the Syrians at Ramoth-Gilead he was mortally wounded. His son Ahaziah of Israel had died, and another son, Joram, now reigned in his stead. During this period, under the influence of the Phoenician-born Jezebel, Baal worship was allowed to flourish alongside that of Israel's God, much to the disapproval of prophets such as Elijah and Elisha. As Elijah's life drew near its end, Elisha went with his master from Gilgal to Bethel, to Jericho, and then to the eastern side of the Jordan River, apparently on a final tour to meet their fellow "sons of the prophets" in these areas. At each stop, Elijah commanded Elisha to stay behind while he went on, but Elisha, passing his master's test, refused to leave Elijah's side. At the Jordan, Elijah touched the waters of the river with his mantle (or cloak) and the two prophets, like the Israelites at the Red Sea before them, passed over on dry ground. Elisha was granted one final request by his master. "Let me inherit a double portion of your spirit," Elisha replied. Elijah said, "If you see me when I am taken from you, it will be yours—otherwise not." Elisha then beheld Elijah in a fiery chariot, taken up by a whirlwind into heaven. Elisha three times disobeyed his master Elijah when he ordered him to stay behind. This can be seen as a final test to prove Elisha understood his master's true heart. Ironically, if Elisha had obeyed externally, rather than following what he knew to be right, he certainly would not have seen Elijah ascend into heaven and would not have inherited "a double portion" of his mighty spirit. 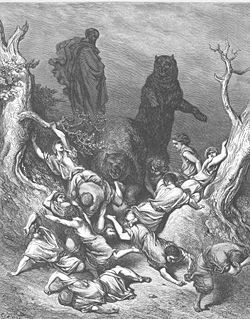 Bears attack the boys who taunted Elisha. Using the special power of the mantle that Elijah had let fall as he ascended, Elisha miraculously recrossed the Jordan. The prophets at Jericho thus recognized him as Elijah's successor and their spiritual superior (2 Kings 2:1-15). He then won the gratitude of the people of Jericho for healing its barren ground and purifying its waters. On his way north toward Bethel, however, he was jeered by a group of boys, who taunted him and called him "bald-head." Elisha cursed them for this, and immediately "two bears came out of the woods and mauled forty-two of the youths" (2 Kings 2:23-25). Before he settled in the northern capital of Samaria, the prophet spent some time on Mount Carmel, the site of his master's great victory over the prophets of Baal (2 Kings 2:25). We learn that King Joram had moved somewhat closer toward the prophetic attitude than his forebears, "removing the sacred stone of Baal that his father had made," but failing to shut down the shrine at Bethel that competed with the Temple of Jerusalem. Like Ahab before him, Joram had also maintained an effective alliance with King Jehoshaphat of Judah, considered one of the "good" kings. Thus, when the armies of Judah, Israel and Edom, made war against King Mesha of Moab in an effort to force him to renew his status as a vassal to Joram, Elisha consented to intervene. Employing a harpist to aid him in his prophecy, he predicted both relief from drought and victory over the Moabites. His oracle was fulfilled on the following morning (2 Kings 3:4-24). That Elisha inherited the wonder-working power of Elijah is shown throughout the whole course of his life. When the widow of one of the prophets was threatened by a hard creditor, Elisha multiplied a small portion of oil so greatly as to enable her not only to pay her debt, but to provide for her family's needs (2 Kings 4:1-7). He got on the bed and lay upon the boy, mouth to mouth, eyes to eyes, hands to hands. As he stretched himself out upon him, the boy's body grew warm. Elisha turned away and walked back and forth in the room and then got on the bed and stretched out upon him once more. The boy sneezed seven times and opened his eyes (2 Kings 4:34-35). At Gilgal, to nourish the local prophets who had been pressed by famine, Elisha miraculously transformed a pottage made from poisonous gourds into an edible stew (2 Kings 4:38-41). At Baal Shalishah, he fed 100 men with a mere 20 loaves of barley bread. Elisha also cured a Syrian commander, Naaman, of leprosy (2 Kings 5:1-19). When Elisha's servant Gehazi sought payment from Naaman against the prophet's wishes, Elisha then cursed Gehazi with the leprosy he had removed from Naaman (2 Kings 5:20-27). When a group of prophets lost a valuable axe-head in the Jordan, Elisha miraculously recovered it (2:6-7). In a more political vein, Elisha warned King Joram of Israel several times of impending military danger from Syrian forces, enabling him to escape the threat (2 Kings 6:8-23). Enraged at Elisha's activities as a kind of spiritual spy, Ben-Hadad of Syria surrounded the town of Dothan in order to capture or kill the prophet. Seemingly hopelessly outnumbered, the defenders were aided by heavenly armies: "Horses and chariots of fire all around Elisha." The prophet struck the Syrian army with blindness and then tricked them into marching helplessly into Samaria, the very capital of Israel. The grateful King Joram asked, "Shall I kill them, my father? Shall I kill them?" But Elisha commanded that Joram prepare a feast for them instead. Afterward, "the bands from Aram stopped raiding Israel's territory" (2 Kings 6:13-23). Ben-Hadad was not so easily dissuaded from his warlike purpose. He surrounded the capital and mounted a siege that lasted so long that Samaria's residents were about to resort to cannibalism. Joram blamed Elisha for the situation (perhaps for not allowing him to destroy the Syrian army earlier) and sought to execute him. Elisha, however, predicted that the siege would be lifted immediately. His prophecy was quickly fulfilled, and one of the king's officers who doubted Elisha's words was trampled to death for his lack of faith. At long last, Elisha now began to fulfill the mission given to Elijah many years previous: to make Hazael king of Syria and Jehu king of Israel. Elisha traveled to Damascus, where Ben-Hadad lay seriously ill. Ben-Hadad sent his lieutenant, Hazael, to inquire of the prophet about his prognosis. Elisha instructed Hazael to tell the king "You will certainly recover." In the same breath, however, the prophet confided: "The Lord has revealed to me that he will in fact die." Elisha then began to weep, forseeing great suffering for Israel at Hazael's hands and telling him: "The Lord has shown me that you will become king of Aram." Thus encouraged, Hazael returned to Ben-Hadad, informed him that would recover, and then suffocated him to death, succeeding him as king (2 Kings 7:1-20). You are to destroy the house of Ahab your master, and I will avenge the blood of my servants the prophets and the blood of all the Lord's servants shed by Jezebel. The whole house of Ahab will perish. (2 Kings 9:1-10). Jehu promptly rode to Jezreel, where King Joram (who was Ahab's son) was recovering from his wounds. "Do you come in peace, Jehu?" the king asked. Jehu replied: "How can there be peace, as long as all the idolatry and witchcraft of your mother Jezebel abound?" Jehu then shot Joram in the back with an arrow as he turned to flee. Joram's ally, Ahaziah of Judah, was also put to death in the coup. Jehu turned next to Jezebel, and the queen-mother died after being thrown down from a high window by her own eunuchs at Jehu's command. Following this, he engineered the killing of 70 of Ahab's male descendants, ordering their heads left in piles at the gates of Jezreel. Turning toward Samaria, Jehu encountered 42 relatives of Ahaziah of Judah who were on their way, so they thought, to greet Joram and Jezebel; and these, too, he slaughtered. Arriving at Samaria, Jehu continued the bloodbath ordered by Elisha: "He killed all who were left there of Ahab's family" (2 Kings 10:17). Carrying Elisha's program to its logical conclusion, Jehu then summoned the priests of Baal to a solemn assembly in the capital, saying, "Ahab served Baal a little; Jehu will serve him much." Once they assembled in Baal's temple, Jehu proceeded to have them all slaughtered, demolishing the temple and turning it into a public latrine. Many years intervene with no biblical record of Elisha's activities. The man whom he made king, Jehu, had long since died himself; and Elisha now lies on his death-bed in his own house (2 Kings 13:14-19). King Joash, the grandson of Jehu, comes to mourn over his approaching departure. In one last prophetic act, Elisha orders a bow brought and commands that Joash shoot an arrow toward the east. "The Lord's arrow of victory, the arrow of victory over Aram!" Elisha declares. "You will completely destroy the Arameans at Aphek" (2 Kings 13:17). As Elisha breathes his last, Joash utters the same words Elisha himself had declared on the passing of Elijah: "My father, my father! the chariot of Israel, and the horsemen thereof." Elisha's miracles, however, have not quite ended. Long after his burial, a dead body is laid in Elisha's tomb. No sooner does it touch Elisha's remains than the man "revived, and stood up on his feet" (2 Kings 13:20-21). Both Elijah and Elisha are considered great rabbinical masters, as well as great prophets. Their last journey together is the subject of much rabbinical speculation. According on one rabbi they discussed the Shema (the holiest Jewish prayer); according to another they spoke of Jerusalem; others assert that they spoke of the mysteries of creation. However, the greatest number believe that they discussed the "mysteries of the chariot"—the first supposed conversation about the Jewish mystical tradition known as the kabbala (Yer. Ber. 8d; comp. Sotah 49a). Having received a double portion of the prophetic spirit, Elisha is believed by the rabbis to have worked twice as many miracles as Elijah (R. David Kimchi's commentary to II Kings 2:14). One tradition holds that the hospitality of the Shunammite woman shows that a woman knows the character of a guest better than a man does (Ber. 10b). Some hold that the unfortunate victims of Elisha's curse at Bethel were impious adults and not children at all (Sotah 46b). Others blame the episode on the residents of the last city visited by Elisha, for they should not have sent the great prophet on his way unescorted. (Sotah 46a) Others declare that Elisha was punished by God for harming these children, and also for his cruel treatment of his servant Gehazi in striking him with leprosy (Sanh. 107b). The critical school holds that the account of Elisha's life and activity is taken from an old cycle of Elisha stories and later incorporated into the Books of Kings. The contents are more legendary than historical. Much of the Elisha story is a rehashing of the Elijah cycle, with similar miracles and circumstances. 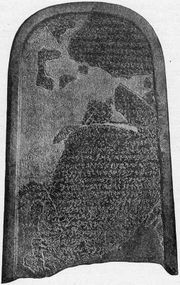 The "Moabite Stone" erected by King Mesha of Moab. Contradictions also occur. A state of peace between Israel and Damascus in 2 Kings 5:1 contradicts the state of war indicated in 2 Kings 6:8. In one chapter, (5) Gehazi is a leper; in another (8) he appears before the king as if nothing has happened. Elisha's place of residence also shifts without explanation. Most striking of all is the contradiction between 1 Kings 19—in which Elijah is commanded to anoint Jehu and Azael as kings—and the rest of the story. Elijah's important task is left to Elisha, and he does not bother to get around to it for many years. The chronology of events is also suspect, probably resulting from the composite nature of the Elisha cycle itself, as well as the final editor's guess work in splicing in its episodes into the account of kings Ahab, Joram, Jehu et al. Despite the clearly legendary character of some of the Elisha stories, parts of the drama provide significant historical data. How reliable these are is another matter. King Mesha of Moab was an historical figure who left the so-called Moabite Stone, which confirms the existence of the "House of Omri" (Ahab's father) as well as describing Israel's attempts to subjugate Moab. Ben-Hadad (Hadadezer) and Hazael of Syria were also both historical kings who made war against Israel. However, the historicity of an Israelite prophet such as Elisha conspiring with Hazael to assassinate Ben-Hadad must be met with skepticism. Indeed, an inscription uncovered recently at Tel Dan in northern Israel appears to contradict the biblical account of Jehu's role in the deaths of Joram and Ahaziah. The most likely candidate as the author of the inscription is Hazael himself, or one of his scribes. The reconstructed writing states: "Hadad made me—myself—king… I killed two powerful kings, who harnessed two thousand chariots and two thousand horsemen. I killed Joram son of Ahab, king of Israel, and I killed Achazyahu (Ahaziah) son of Joram (Jehoram) king of the House of David." In any case, modern scholars agree that the Elisha cycle can not be considered as a coherent production of one author. A more probable explanation is that various stories arose about the prophet from several sources and were later compiled into one or more documents. The final editor of Kings, later still, incorporated these stories into his narrative, splicing them in where he thought they best belonged. Even more difficult than the historical and literary issues of the Elisha cycle, however, are the moral ones. Elisha, the great prophet of God, is also a moody, vindictive man who causes serious harm to children and curses his own servant with leprosy. He commissions the assassination of two kings (Ben Hadad and Joram). His agent, Jehu, takes it upon himself to murder a third, Ahaziah of Judah. Elisha also orders a bloodbath against the descendants of Ahab that in any modern context would make him a criminal of the first degree. While all of this may be justified with reference to God's will, it leaves the modern reader with a moral dilemma: Does a God of goodness truly order political assassinations and murder to achieve His ends? ↑ Jewish Encyclopedia, Elisha. Retrieved January 7, 2019. Bright, John. A History of Israel. Westminster John Knox Press, 2000. ISBN 0664220681. Grant, Michael. The History of Ancient Israel. Charles Scribner's Sons, 1984. ISBN 0684180812. Keller, Werner. The Bible as History. Bantam, 1983. ISBN 0553279432. Lowrie, John M. The Prophet Elisha. Scholarly Publishing Office, University of Michigan Library, 2005. ISBN 978-1425527532. Miller, J. Maxwell. A History of Ancient Israel and Judah. Westminster John Knox Press, 1986. ISBN 066421262X. This page was last modified on 7 January 2019, at 21:43.